Are asphalt roofing shingles your area of expertise? Probably not. But when it’s time for a roof replacement, your roofing shingles become a major priority. Here’s what to know to start talking with your roofing contractor. Shingles are the basic 3-tab shingles that are on many homes with roofs nearing replacement age. Shake-style shingles are asphalt shingles designed to look like cedar shakes — hand-split wooden shingles individually applied to a roof base. The material and application process is very expensive, and that’s why dimensional asphalt shake-style shingles are so darn popular.Most new and replacement roofs that you see today are constructed with shake-style shingles. Don’t be afraid to ask what exactly an asphalt shingle is. That’s why we’re here! 2. Dimensional shingles — The most common roofing shingle in North America. These shingles are dual-layered, appear thicker on the roof and are heavier than the typical 3-tab shingle. 3. Premium shingles — Sometimes called laminated shingles. These beauties include shake-style shingles and other, so-called “Old World” shingles that look like slate, wood, etc. They’re not just pretty! “Premium roofing shingles might also have important functional improvements such as impact resistance or solar reflectivity that can possibly extend the life of the roofing system or provide lower energy costs,” CertainTeed notes. Even non-roofing professionals can recognize the difference of shake-style shingles from a distance. How? They look three-dimensional, just like real cedar shakes. As cedar shakes age, their color transforms from a bright, warm tone to a duller, gray color. 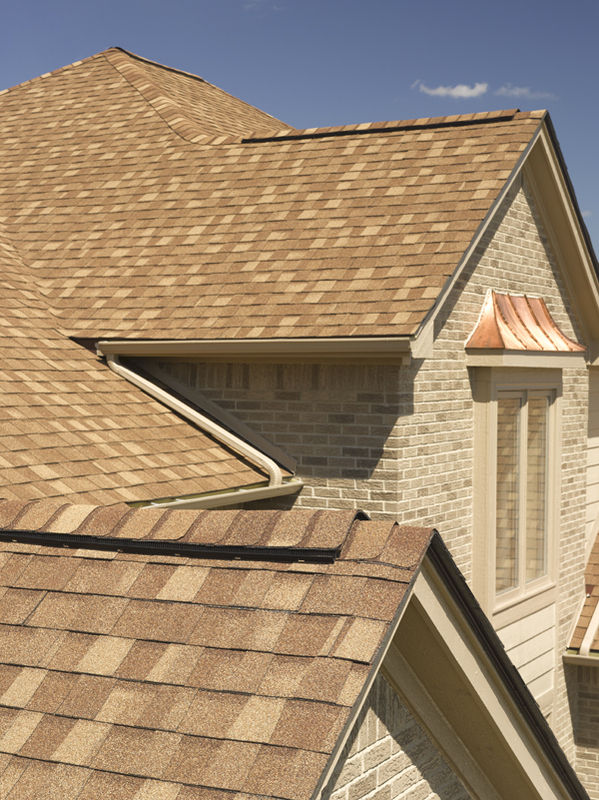 Shake-style shingles are available in several shades of brown and gray — just like new and aging cedar shakes. The high-quality ceramic granules on shake-style shingles add all of the color depth and dimension that Mother Nature gives to real cedar shakes over time. Are composed of one single layer. Minimal textural dimension and shadowing. Each shingle is constructed with a slightly different degree of weight and durability. Quality fiberglass basemat provides flexibility and quality at a good value. Last about 20- to 30-years. Most shingles are warranted to perform for 20, 25 or 30 years, depending on brand and style. Many 3-tab shingles carry the same UL Class A fire resistance rating as dimensional shingles because they’re generally made of the same materials.However, their wind resistance ratings are lower than shake-style options. If you live in a region prone to strong winds (gusts greater than 60 or 70 miles per hour), this may be a deal-breaker for you. Are bigger and stronger. Shake-style shingles are asphalt shingles, just like “regular” shingles, and are made of multiple layers for added strength.Presidential Series shake-style shingles from CertainTeed, for example, are available in dual and triple-laminate options and are constructed of two or three layers of laminated fiberglass base for extra durability. The luxury shingles are some of the thickest, toughest and heaviest on the market. Take more punishment. Shake-style shingles with triple laminate construction are among the best-performing asphalt shingles on the market. The three layers provide added protection from heavy winds.Shake-style shingles are an excellent choice for regions prone to severe weather.They’re generally rated for wind speeds in excess of 100 miles an hour! Are more expensive. Worth the investment? You decide. A bit pricier when compared with 3-tab shingles. Many homeowners find that the difference in upfront cost is worth the improved aesthetics and durability.“Make the extra effort to choose the right style shingle for your home,” Jeff Frantz, Washington D.C. territory manager for CertainTeed Roofing Products, says. “Curb appeal makes the difference. In many cases, your roof accounts for 33 to 60 percent of your home’s exterior appearance. Three-tab shingles might cost less initially, but they aren’t going to give a premium look to your roof. You’ll also miss out on a lifetime limited warranty.”Another factor to consider? The extended warranty that shake-style shingles offer. Shake-style shingles’ durability allows companies like CertainTeed to offer lifetime limited and 50-year transferrable warranties. If you replace a 3-tab roof after 25 years, but your shake-style roof lasts 50, you saved money in the long run. Let’s talk about your roofing needs. A trusted roofing contractor like Long Roofing is there for you through every step of the decision-making process. When you need a roof replacement, talk to Long Roofing’s SELECT ShingleMaster-certified experts who will give you peace of mind and a 50-year, no-nonsense warranty. Contact us today.